As Jersey Island is plagued by a string of murders, a troubled young woman named Moll meets a man named Pascal who saved her from being assaulted. The two quickly fall in love, but their relationship starts to fall apart when he becomes a suspect in the ongoing murder investigation. Uncertainty is a terrible thing and can eat away at people. It is why accusations can be just as damaging as convictions, especially in a small town when it is about an emotionally-charged subject. "Beast" is the feature film debut of writer/director Michael Pearce. The film draws inspiration from true events, namely the string of murders on Jersey Island that are mirrored in this story and fill the backdrop of an otherwise fictional tale. 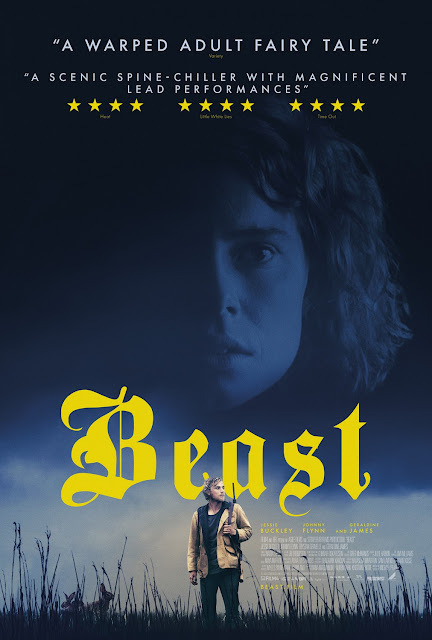 "Beast" revolves around a young woman named Moll (Jessie Buckley) who lives with her parents to help take care of her father. She believes her mother Hilary (Geraldine James) demeans her and shows preference to her sister Polly (Shannon Tarbet), who regularly overshadows her. After Polly steals her thunder by announcing her pregnancy during Moll's birthday party, Moll storms off for a night of drinking and dancing at a local club. She leaves with a man who starts to try to force himself on her. Luckily, another man name Pascal (Johnny Flynn), who was out poaching rabbits, is nearby and chases him off with his gun. Pascal and Moll fall in love over the following weeks, but when Pascal becomes a suspect in an ongoing murder investigation, it may be more than she can handle. "Beast" reminds us of a much more intimate, much more British version of something like "Summer of Sam" or "The Hunt." It deals with similar themes and shows how fear and paranoia can bring out the worst in people. The town in "Beast" is on edge because of a bunch of murders where the victims have all been young women. Accusations fly about anyone who looks even slightly suspicious, and those who may have a less than savory past are seen as threats. The film starts as this offbeat romance where a rebellious young white-collar woman falls for a dirty blue-collar working man much to the chagrin of her overbearing mother. We see Moll's regular acts of defiance as she often justifiably lashes out in immature and destructive ways. As the movie moves along, the paranoia and uncertainty of the situations start to surround us just as much as it surrounds Moll. We found ourselves looking for truths that we may never know for sure. We share in her isolation and the wonder about the awkward, uncomfortable moments that she now engages in. We recoil as she receives stares, whispers, and sometimes verbal assaults from the crowds of people who have already made up their minds and judged her boyfriend for things they assume, but do not know for certain, are truths. Some viewers will be unsatisfied and potentially upset by the levels of ambiguity that occur in "Beast," but we believe the events that play out couldn't have happened any other way without falling into standard mystery cliches. The movie left us with just as many questions as answers, and in the end, we have to decide for ourselves what it all means. Beyond being a wonderfully suspenseful thriller, "Beast" is a beautifully shot film with brilliant cinematography. 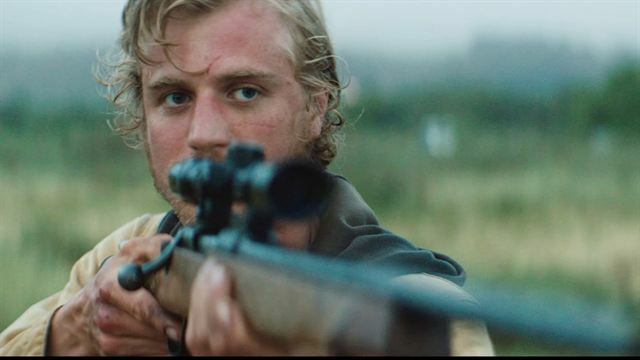 The acting from both Jessie Buckley and Johnny Flynn is tremendous, and we can't wait to see what they do next. Their performances plus a compelling narrative kept us completely engaged from beginning to end. We thoroughly enjoyed watching this story play out and were even left on the edge of our seats wondering what was going on and how it would end. This is a very well-done movie that must be seen!